ANONYMOUS - Accurater Grundriss und gegend des vestung Asoph samt der Russischen Belagerung. Title : Accurater Grundriss und gegend des vestung Asoph samt der Russischen Belagerung.. 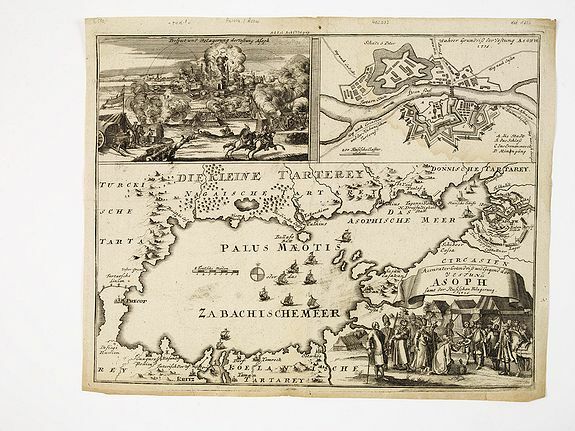 Description :A map of the Black Sea with in top a plan and siege of the town of Asoph, "Prospect und Belagerung der Vestung Asoph” and "Plan “Wahrer Grundriß der Vestung Asoph 1736". From "Voyages en Moscovie, Tartarie et Perse, par Adam Olearius". Adam Olearius was a seventeenth-century German scholar, employed as secretary to an embassy sent by the small German state of Holstein to explore an overland trade route with Persia. The first embassy was dispatched to Russia in 1633-34 to secure the tsar's permission to travel and ship through his realm. The second was sent in 1635 to complete the deal with the king (shah) of Persia. Although the commercial mission failed miserably, the embassy was successful in the incredible amount of information gathered by Olearius. After returning to Holstein in 1639, Olearius continued in the Duke's service and published the first edition of his travels in 1647. Condition : A somewhat weak impression. Good margins.